★ Slots Deposit By Phone Bill ★ PocketCasino.eu™ - Play Now! An entire casino in your pocket! Deposit by Phone Slots and getWelcome Bonus 100% up to $/£/€100 + 20 Free Spins on Shaman's Dream! Play all our Roulette Games, Scratch Cards and Slots by Deposit Phone Bill. Discover our entire Welcome Bonus 100% up to $/£/€100 + 20 Free Spins on Shaman's Dream! 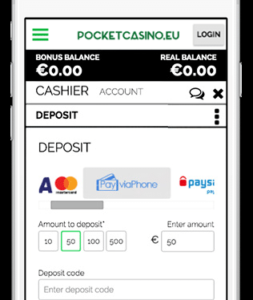 Only at Pocket Casino EU you can Deposit by Phone Bill and play all Slots! Pocket Casino EU has over 400 games you can play using your phone! When you deposit by Phone Bill, you receive aWelcome Bonus 100% up to $/£/€100 + 20 Free Spins on Shaman's Dream on top of your deposit value! If you would deposit £10 using your phone bill, we will match up your deposit with a Welcome Bonus 100% up to $/£/€100 + 20 Free Spins on Shaman's Dream! As a result, you would be playing with £20! In the lobby, click Join Now and fill in the registrations form. Please note that it is of importance to enter your correct mobile phone number as we will be sending you a verification message with a code you will require to deposit. Go to the deposit page and enter the code you have been sent when signing up. Pick the “Pay via Phone” deposit option, choose the amount and enter the 4 digit code you receive for the deposit. You can Play Right Now! Congratulations! You now have enough funds to start playing all your favourite Slots that accept Deposit by Phone Bill. That’s over 400 games! Enjoy your deposit value for longer as we doubled it the second you deposited. Now get out there and Play!